What makes our Free Demand Program different is YOU decide how to use it. YOU decide the length of the demand period up to 10 business days. 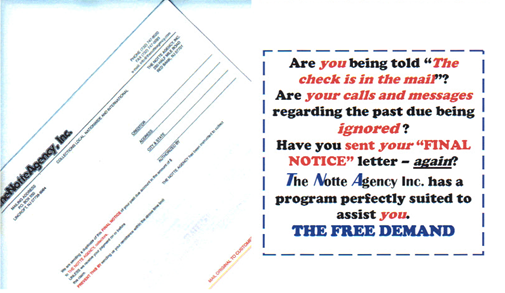 YOU can generate the notice or have our office do it for YOU. It’s a great tool for encouraging slow payers to bring their account to current. It incurs no cost to you when paid under the Free Demand Program. Fill in our placement form on our website.